Having Outlook as your calendar can significantly reduce the time you spend planning and organizing your day. You probably already use it to log your appointments, work meetings, and other events in your life, but all those entries can get hard to visually identify and this is were color categories can be very helpful. 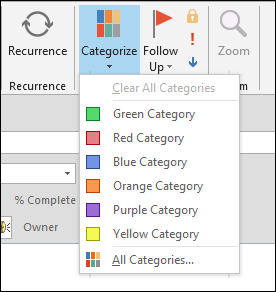 Using color categories in Outlook can help you to sort your entries and ensure that you can easily find the relevant appointments at a glance. 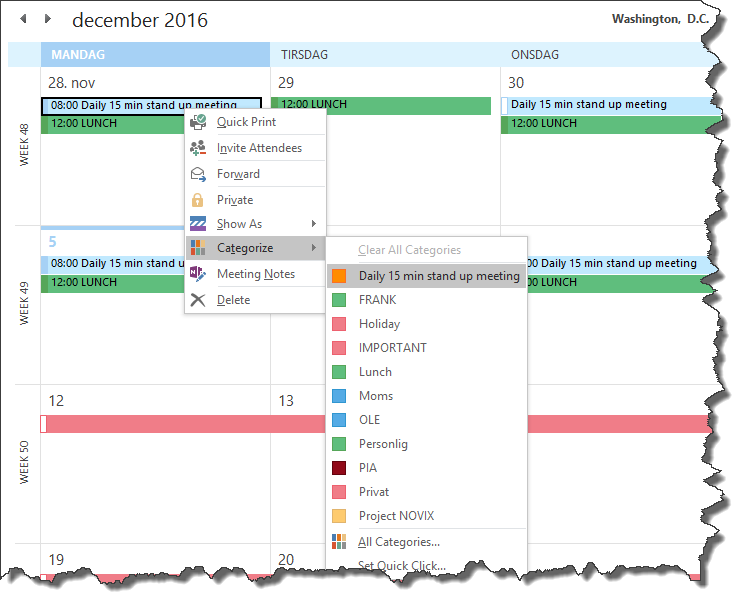 Work and personal calendar events with different color categories makes it easy to visually identify them. 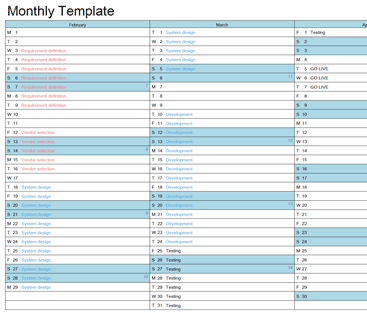 Furthermore, organizing your calendar with color is a great way of keeping it neat when you print it. Everybody likes personalizing their experience and making their settings their own, and Outlook lets you do this easily. Adjust the categories to suit you and your life. Note: Categories are not supported by the IMAP account protocols. In this case you will not be able to use color categories. How to organize & name categories in Outlook? 1. Open Outlook and click Categorize on the toolbar. This will show you the default categories if you have not meddled with them before. 2. In order to manage keyboard shortcuts and names, click All Categories… This will allow you to set up your categories as you please. Notice in the above screenshot, how we’ve assigned “CTRL+F2” to the blue category. 3. In this dialog, you can adjust your categories to match your needs and types of appointments. Ideas for category names could be Family, Work, Urgent, Miscellaneous or Personal, but you can name them as you please. Select Rename while highlighting a category to give that category a different name. 4. The New… button will allow you to create a new category. While this may be beneficial in some cases, it can lead to confusion in others. Try to think of how many appointments you usually have for a given category—is it necessary to have separate ones for meetings with different groups of colleagues, or could you bunch them together in one category? 5. Select an appropriate shortcut key with the drop-down menu under Shortcut Key. Doing this and memorizing your shortcuts will make it easier for you to assign them quickly and efficiently. Once you get the hang of it, you will probably start to do it almost automatically. 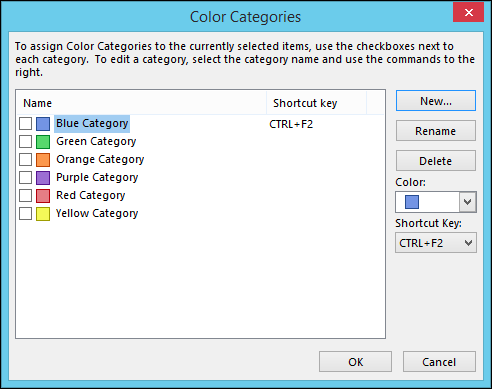 Note: The first time that you assign a default color category to an item, you’ll be prompted to rename the category. 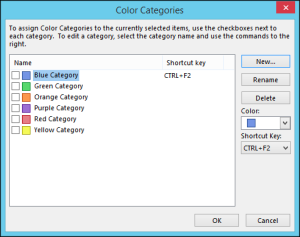 At this time, you can also change the color of the category and choose a keyboard shortcut. 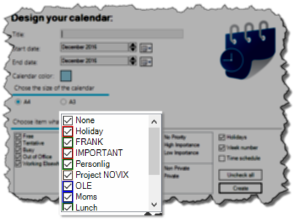 Right click a calendar item and click Categorize. Select one of the categories or create a new one in the All Categories.. selection in the buttom (Read the guide above). 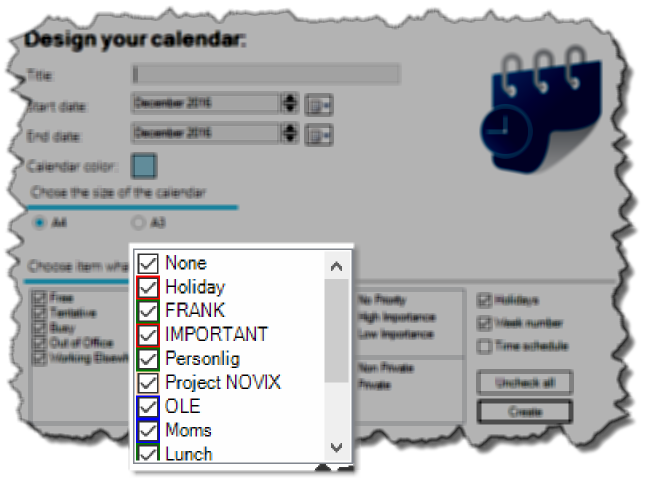 When you assign a color category, that color is used as the item’s background color on the calendar grid. 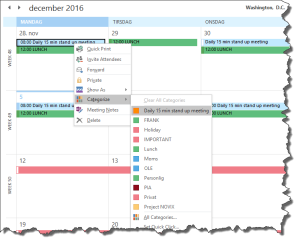 Categories can be used for any item within Outlook, not just the calendar—but it is especially useful if you have a lot of appointments, events, meetings, and so forth. When everything is sorted according to your liking, it is both easier to scan through it and to use the printed version as effectively as possible. 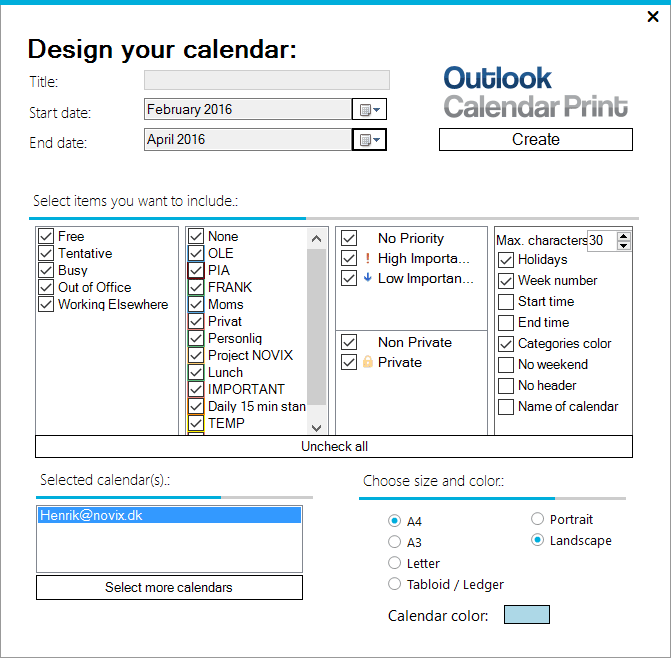 By default it is only possible to print all your calendar items from your Outlook calendar. 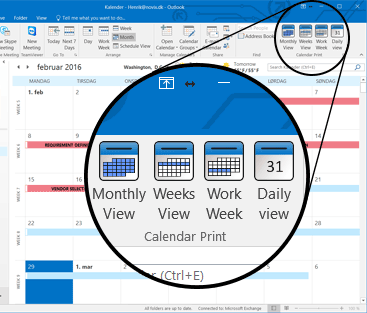 In the past you could use Calendar Printing Assistant from Microsoft if you only needed to print some of your categories, but it is not fully compatible with Outlook 2013 & Outlook 2016 and if you are running 64bit version of Outlook it will not work. But fortunately there is a solution to this, the solution is Outlook Calendar Print. 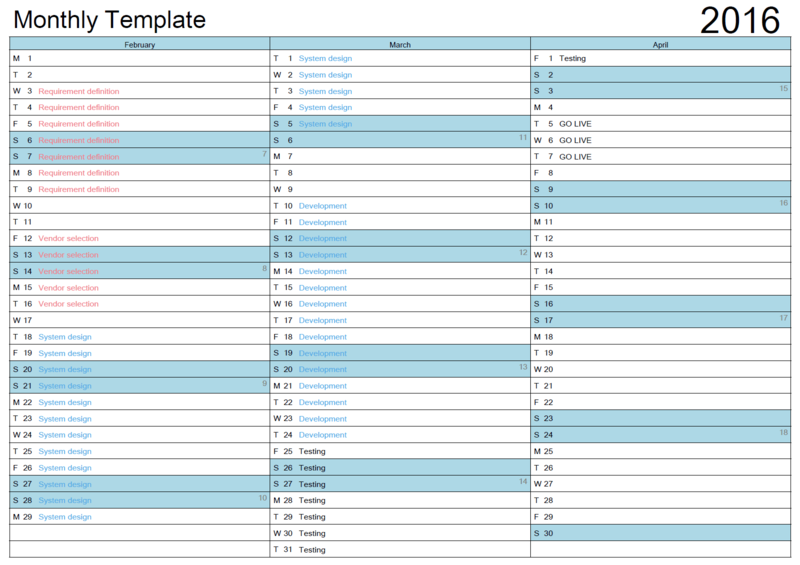 In the design step 2, you can select which categories you want to print. You also have the option to deselect all private items, and only print you business appointments. 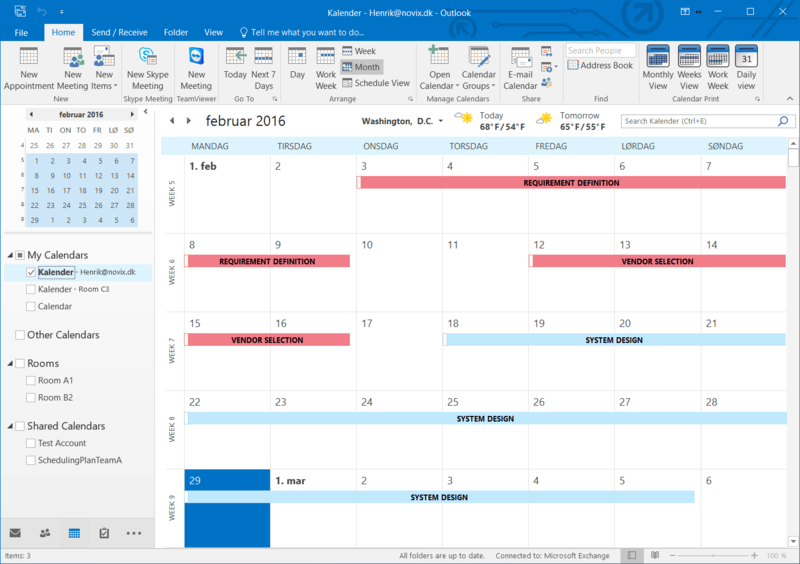 You’ve learned how to use colour categories in Outlook, and with this knowledge, you can fine-tune your calendar. Become a master organiser, and never lose an appointment again!